Is there something you’d like to give up on right now? There have been many times that I have wanted to give up on things. Things like trying to communicate with my husband or continuing to help a close friend when they didn’t seem to be doing much to help themselves. I had thoughts of giving up when I first started training because I wasn’t making any money and I wasn’t getting any recognition for my efforts to be a perfect trainer while working ridiculous hours (5:30am – 7pm… CRAZY). Seems like the things that have challenged me the most in my life are the things that I am most proud of ‘sticking by’ today. Things like the bond Neil and I share, the closeness I feel with my lifelong friends and of course the lives I’ve been able to touch through my training approach. So again I ask, what are YOU ready to give up on? I was so inspired by a message I heard this weekend and I couldn’t wait to share it with you. It’s about how we always seem to stop moving toward a goal when we’re only steps away from finally achieving it. This message certainly applies to people’s struggle with maintaining better health (eating well and exercising regularly), however it also has a personal twist that I think everyone can relate to. your financial situation to change after pinching pennies for months or years! We all want to give up sometimes. Perseverance is no easy task. Sometimes the progress we’re making isn’t obvious so its hard to keep faith that what we’re doing WILL pay off! We stop short of victory because struggle blocks our perspective and we loose faith in what we hoped and KNEW would come true. Since we never know how far away we are from victory or how long the struggle will last, I think its good to imagine that we’re very close. Because, what if we are very close? 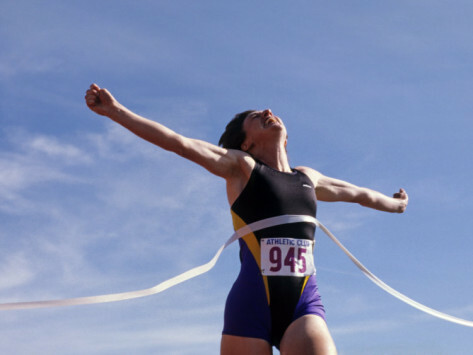 What if you’re running the FINAL lap in your race to victory right now? What if this is it? 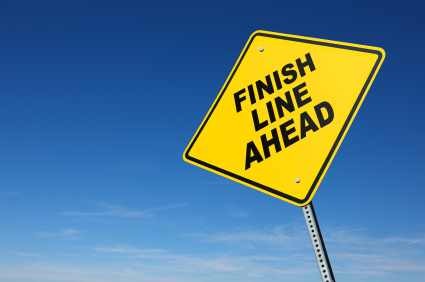 What if you’re only 1 LAP away from the finish line. Don’t stop short. Your victory is coming! Keep running! You’re almost there! Don’t grow weary, you’re situation will soon change! So whatever it is that’s discouraging you and making you feel like you’ll never see the fruits of your labor cast out of your mind. Instead, say to yourself, “I’ll keep running! I’m tired but I won’t stop because I may be on my last lap!” Don’t give up. Your victory lys ahead.